Very pretty with a wonderful reflection. My only wish is that it were a tad sharper. Do you mind sharing some settings? A really wonderful reflection. I would like to hear the settings too. Iggy..thank you and I am happy to tell you the settings and hopefully you can help me get a sharper lily. With my husband's Nikon D300 (which I is a little overwhelming for me) the settings were ISO 400 ( I had been shooting in the shade so had changed the ISO), F8, 1/1000, 200mm (18-200 zoom lens). I did not use a tripod as I was in the middle of staining our deck but could not resist running inside for the camera when I saw the lily.....soooo is this just a case of shaky hands? I am grateful for any suggestions. Oh, man, now it's my turn to do a Wicked Dark. I was up at the train depot Monday, and the koi pond had water lilies in bloom. Haven't processed them yet, and you got a lot closer than I could. Nice shot. I like the colors and the hint of reflection. what a beautiful shot! 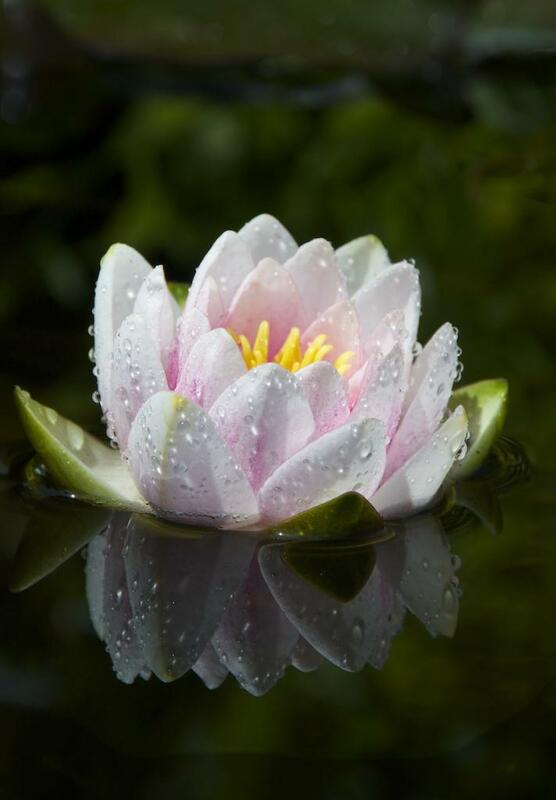 love the reflection and the water drops on the lilly! beautiful lily! I love the water drops and the reflection.